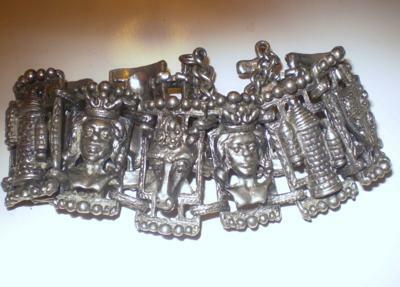 This Vintage gothic bracelet is like out of a fairy tale! Each section is a chess piece character and the detailed metal work is superb. It is very heavy with safety chain, for reinforcement because of the weight. Could be Trifari as they were known for there chess piece jewelry.